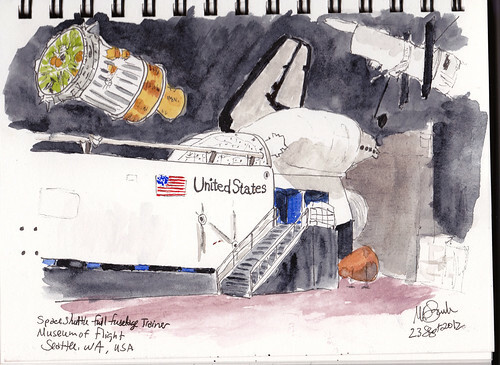 I've watched the pieces of the SpaceShuttle Full Fuselage trainer arrive and be assembled and I've sketched these pieces andevents before. The FFT is the full size model of the Space Shuttle on which every astronaut trained. The museum's bid for one of the actual shuttles did not win but I think the FFT will be more educational and interesting. It is nearly nearly fully assembled. It was open today for one day and then will be closed until November for completion of the assembly and the displays. I made sure to see it. I was very excited to finally be able to walk along the pay load bay. First I photographed it thoroughly and attended the presentation by a group of astronauts and mission control specialists. Then I had to do one sketch. This took me about 2 hours. I was seated next to the wall, across from the Shuttle landing simulator. I heard a lot of crashes as visitors failed to successfully land in the simulator! Hanging over the payload bay is the Boeing Inertial Upper Stage (IUS) launched from the payload bay after reaching orbit. It carried satellites to geosynchronous orbit 26,000 miles above Earth. Several probes also used the IUS to send them on their way to other planets in the solar system. Boeing Aerospace designed and built the IUS under contract with the Air Force. Hanging off the the right is a 1:2 scale model of the Hubble Space telescope. The Charles Simonyi Space Gallery will not open until November. I found this to be a very interesting and exciting exhibit. I encourage you to watch the website and visit once it is open again. On my personal blog I have my notes from the presentation and some photos. Interesting Kate. I look forward to seeing it.